NASCAR CEO Brian France’s endorsement of Donald Trump for president doesn’t say anything good about NASCAR’s future—or its present. After we published our piece on the subject, France did an interview with the AP where he basically admitted he has no idea what he’s doing. It’s into that cauldron that France inserted himself and his sport — admittedly without knowing all of what Trump has proposed. “I don’t even know all their policies, truthfully,” France said. He said he likes Trump’s “business approach” and his status as a Washington outsider. He also cited the electricity around the Trump campaign and a friendship with one of Trump’s sons, Donald Trump Jr., that dates back nearly two decades. I’m not sure I buy that France isn’t too familiar with Donald Trump’s political positions. Not only have they received extensive media coverage, but there have been 11 Republican presidential primary debates so far, of which Trump has appeared at 10, along with many more Trump rallies with which to familiarize oneself with his campaign’s policies. There’s even another Republican debate tonight, which France can watch at his leisure, should he wish to actually familiarize himself with what exactly he’s endorsing. On the chance that France was spurred to talk to the AP based on our criticism, maybe we can give him a head start. From this point on, I’ll address him directly. Before I start, I want you to understand that this is not a judgment upon your own character. I’m sure, if we were to meet, you’d be a nice guy. But when you endorsed Donald Trump the other week, it was unlike any other form of political support you may have given before, and I’ll explain why. It doesn’t really matter, in the grand scheme of things, whom you endorse for President. You say you supported both Obama in 2008, and Romney in 2012. That’s fine! Really, it is. They had opposing political views, sure, but there’s nothing wrong with changing one’s stance on a political issue. Plenty of people voted for both men at different times. But Trump, unlike any other presidential candidate since George Wallace (whom your grandfather endorsed, and who uttered the famous line of “segregation now, segregation tomorrow, segregation forever,”) has built a platform based almost entirely upon racialist views, along with a long and disturbing history of racist statements. And you spent your first public endorsement—not your first political contribution, but public endorsement —on him, surrounded by NASCAR drivers. He began his campaign by denouncing Mexican immigrants as “rapists.” He has said that “laziness is a trait in blacks.” He’s insulted Jews. He’s insulted Catholics. He’s insulted Muslims. He’s insulted women. He’s insulted pretty much anyone with a shred of human decency. And that’s not without even getting into his history as a pathological liar, which, whatever, he’s a politician, and the bar is pretty low on that one. I understand you’re defensive of your record on NASCAR’s diversity program, and that you’ve already spent “millions” on it. Any amount of money spent is more commendable than no money at all, I suppose. But by endorsing Trump, you’ve drawn attention to your efforts, which would inevitably draw criticism of the same. And it’s not a huge leap to wonder why your efforts really aren’t working. The reason why they’re so blatantly half-assed, for lack of a better term, is your strange notion of what is considered fair in the world of racing. “It would be a conflict of interest,” your spokesman said in 2009, for NASCAR to be supporting individual drivers in the name of diversity while also adjudicating the rule book. And that’s not an invalid point! It would be a conflict of interest, of sorts, if not merely an appearance of one, for NASCAR to be financially supporting individual drivers. But NASCAR, and the world of racing in general, has never been about fairness. To say that NASCAR is “fair” is to live in a fantasy world. It’s anything but fair. Do you actually believe that Dale Earnhardt, Jr., a NASCAR star, would’ve made it to the top level of the sport if his father was a middling accountant, instead of one of the greatest legends NASCAR has ever seen? What about Chase Elliott, who appeared at the rally with you, and who’s the son of 1988 Winston Cup Series champion Bill Elliott? 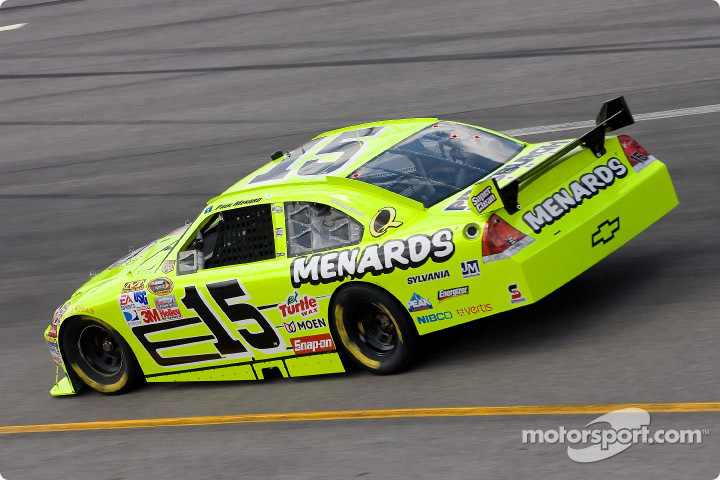 What about Casey Mears, nephew of four-time Indy 500 champion Rick Mears? Or Brad Keselowski, son of former NASCAR driver Bob Keselowski? Or Austin Dillon, grandson of NASCAR team owner Richard Childress? Or Paul Menard, who has no real family history in NASCAR, but whose family name graces approximately 300 big-box hardware stores across more than 10 states, and whose logo graces his car? Or Michael Annett, whose father is the CEO of TMC Transportation services, which bills itself as the “nation’s largest employee-owned flatbed transportation company,” and has sponsored his race cars throughout his career, up to and including his ride in the NASCAR Sprint Cup? Whether we like it or not, NASCAR success (and certainly racing is a whole!) seems to follow family connections and money to a degree unheard of in many other sports. Even Michael Jordan’s kid couldn’t hack it in college basketball. There is no fairness in racing. So to pull the plug on NASCAR drivers from non-traditional backgrounds, right as they take their first big step into NASCAR’s third-highest racing series, is disingenuous at best. But if we bring it back to why you endorsed Donald Trump to begin with, you said it was because you were a friend of the Trump family, and you don’t necessarily agree with all of his policies. I get that. There have been politicians I’ve voted for, and likely will vote for in the future, who have policies that I don’t agree with, either. And I get why you’d want to support your friends, too. That’s what friends do, right? You don’t have to vocally endorse your friends’ political positions in the public sphere, though. I disagree with my friends here all the time on Jalopnik. It’s okay, no harm, no foul. As I said yesterday, I am worried about the harm your endorsement will do to the future of NASCAR. Hopefully people will forget about it, and treat it as a momentary lapse of judgment. And hopefully, we can all learn from this one. Correction: This post originally said that Casey Mears was Rick Mears’ son. Casey Mears is Rick Mears’ nephew. We regret the error.